Draplin Design Co.: Popping Up This Saturday At Outlet PDX! Popping Up This Saturday At Outlet PDX! PORTLAND POP-UP ALERT: This Saturday at Outlet PDX! Yes! Yeslet! 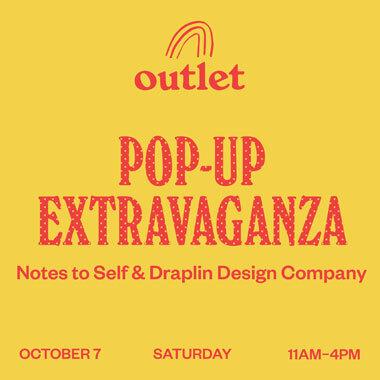 Just got the big news that we�€™re doing a DDC & Notes to Self pop-up at Outlet PDX on Saturday, October 7 from 11am-4pm! Come hang out! Under the watchful eye of our buddy Kate Bingaman-Burt! We�€™ll have a full offering of DDC merch in tow, and, Leigh’s entire line of cool stuff from her new project Notes To Self! Come hang out! General conversation, weather speculation, book signing, high fiving, chewing the fat, shaking hands, spinning yarns and whatever else we can pack in from those five hours. Here’s the official link to it! Love all that yellow!